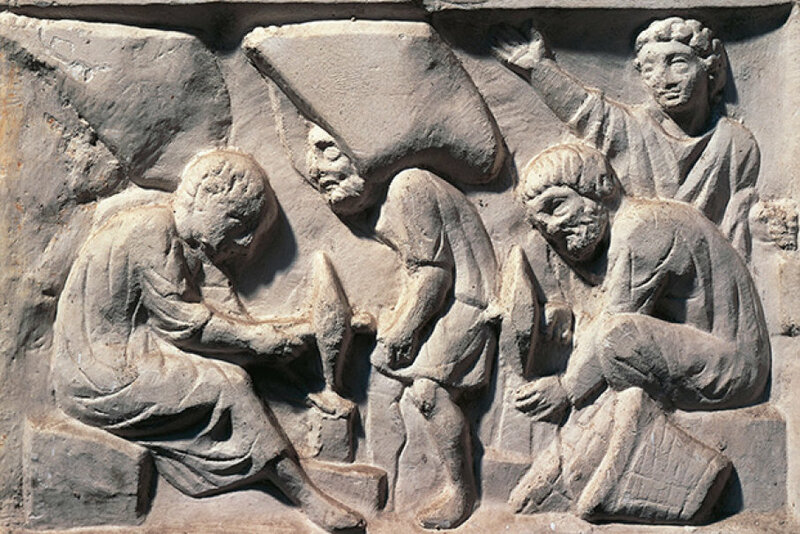 Photo depicts stonecutters in Ancient Rome. You are hosted by Abraham the host of God. He would also raise up a torch and go through the streets of the village, looking for foreigners. Taking the old man and his disciple and the other foreigners that he found, he went home, and putting water into the basin, he washed the feet of the disciples and of the old man. He had no other property of his own in his house, or in any other place, only God alone. He set the table for them and after they ate he took the leftovers and threw them to the dogs in the village. It was his custom to do this, and from evening until morning he would not allow a single crumb to remain in the house. The old man took him aside and they sat until nearly dawn, with many tears talking about the things that lead to salvation. Early in the morning, they kissed one another and the old man and his disciple departed. While they were on the road, the disciple asked the old man’s forgiveness, saying, “Please, father, tell me who that old man was and where you know him from,” but the old man refused to speak to him. Again the brother asked for forgiveness, saying, “You’ve confided many other things to me, and now you won’t confide in me about this old man?” But the old man refused to confide in him about the old man so that as a result the brother was saddened and did not speak to the old man until they reached Scetis. After the brother went to his cell, he did not bring the old man a small meal as was the custom at five p.m. (the old man maintained this practice all the days of his life).178 When evening fell, the old man went to the brother’s cell and said to him, “Why is it, child, that you’ve allowed your father to die of hunger?” The disciple said, “I don’t have a father. If I had a father, he would love his own child!” The old man said, “It’s obvious that you’re not going to serve my meal.” He was taking hold of the door in order to open it and leave when the brother came up and grabbed the old man and began to kiss him, saying to him, “As the Lord lives, I will not let you go if you do not tell me who that old man was!” The brother was unable to see the old man distressed for any reason, for he dearly loved him. Then the old man said to him, “Make me a little something to eat and then I will tell you,” and after the old man had eaten, he said to the brother, “Do not be stiff-necked. I did not tell you on account of what you said when you were in the village. See that you do not repeat what you hear. “That old man is called ‘Eulogius’; by trade he is a stonecutter. He earns a keration a day from his manual labor, eating nothing until evening, and when evening comes he goes to the village and takes home whatever foreigners he finds and feeds them, and their leftovers he throws to the dogs, as you saw. He’s been a stonecutter by trade since he was a young man up to today; it has been a hundred years and more. God provides him with strength equal to that of a strapping young man, and each day to this very day he works for the same one keration. When I was younger, forty years old, I went up to sell my handiwork at that village and at evening he came and took me and other brothers with me, as was his custom, and gave us lodging. “I saw that it was as though I were standing in the Church of the Holy Resurrection and a young man was sitting upon the blessed stone [see Mt 28:2 and parallels] and Eulogius himself was standing at his right. The young man sent near me one of those standing by and he said to me, ‘Are you the one who has pledged himself for Eulogius?’ and I said to him, ‘Yes, master,’ and again he spoke, ‘Tell him that I will demand the pledge,’ and I said, ‘Yes, master, with me as the pledge, only multiply your blessings upon him.’ I then saw two personss emptying a very large amount of money into Eulogius’ lap and Eulogius’ lap was able to hold it, however much the two kept pouring. When I woke up I knew that I had been heard and I gave glory to God. “I left to look for a ship and found one bound for Alexandria and boarded it to sail to my cell. I boarded ship alone and sat by myself, feeling discouraged, and once again I saw myself in a dream in the Church of the Holy Resurrection and that young man was sitting upon the holy stone; he turned towards me in a threatening manner so that, afraid of him, I was trembling like a leaf and was unable to open my mouth, for my heart had turned to stone. He said to me, ‘Aren’t you going to go fulfill the pledge?’ and he ordered two of those standing at his side to hang me up with my arms tied behind my back, and he said to me, ‘Do not pledge yourself beyond your ability to do so; do not gainsay God.’ I was unable to open my mouth and remained hanging there. “Suddenly there was a voice: ‘The Augusta is coming!’ and when I saw her I took courage and said to her in a subdued voice, ‘Have mercy on me, mistress of the world!’ She said to me, ‘What do you want now?’ I said to her, ‘I am hanging here because I pledged myself for Eulogius,’ and she said to me, ‘I am making entreaties on your behalf.’ And I saw her leave to kiss the feet of that young man and the young man said to me, ‘Do not do this any longer.’ I said, ‘No, master, I won’t. I had asked in order to be of service but I have sinned. Forgive me.’ He gave the order and they released me, and he said to me, ‘Go to your cell, and I will return Eulogius to his former way of life. Do not be anxious.’ When I awoke from sleep, I was suddenly deliriously happy, having been set free from such an onerous pledge, and I set sail, giving thanks to God. “And he came to his senses and said, ‘Wretched Eulogius, get up, take your stonecutting tools and you too go, before you also lose your head. There is no royal court here!’Taking his stonecutting tools, he went out to the rock where the money had been and, striking it for six hours, did not find anything, and he began to remember the foods and the attendants and the treachery that took place and once again said to himself, ‘Get yourself up; you’re in Egypt now.’ Little by little the holy young man and the Queen Mother of God brought him to his former way of life, for it would be unjust of God to forget his previous labors. These things Abba Daniel openly told to his disciple after they had sailed up from the Thebaid. Marvellous is God’s loving care for humanity, how he raised up such a person from among the lowly and humbled such a person for his benefit! Therefore let us pray that we too may be humbled by the fear of God and of our Savior Jesus Christ, that with the prayers and entreaties of our Queen and ever-virgin Mary, the Mother of God, and of all the saints, we may find mercy before the terrible judgement seat. Amen.